The rushing gurgle of the Mambova Rapids casts a soft blanket of sound over Kaza Safari Lodge (previously known as Impalila Island Lodge), a most secluded Chobe destination. Nestled at the junction of four countries - Namibia, Botswana, Zambia and Zimbabwe - and at the meeting place of the mighty Zambezi and Chobe Rivers, Kaza Safari Lodge is a waterbound wonderland. With over 100km of waterways to traverse, it is only 80km upstream from the Victoria Falls. Surrounded by rippling beds of pink-tinged waterlilies and riverbanks of tall grass, the lodge lies protectively under the branches of a giant baobab that keeps any bad dreams, and even too much reality, at bay. Eight luxury en-suite chalets all with river views echo the colours of Africa. Here, long days and longer nights hold the promise of tranquillity and relaxation. This is a wild land, and Kaza Safari Lodge is wrapped warmly in its embrace. Light arching through long-stemmed wine glasses throws colour onto crisp linen laid artfully across wood - a feast as much for the senses as for the stomach. An attentive team produces culinary art, and mealtimes become a ritual of their own. Our seductive rivers invite you to explore the quiet backwaters. View Africa's big game and birdlife by boat at sunset, or take on the legendary Tigerfish. We offer our guests an unsurpassed fishing experience. Follow the island's footpaths for a peerless cultural village visit and learn the medicinal uses of its indigenous plantlife. Easily accessible, Kaza Safari Lodge offers enjoyment of the natural flows of life, the rivers, the varied floodplain habitats, the constellations and more - always an abundance of comfort. 8 river facing wood and thatch chalets, which can be either double or twin bedded. 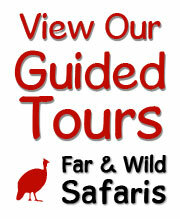 Guided walks on the island including afro-botanical walks, cultural village walks and a walk to a 2000 year old baobab. Game cruises to the Chobe National Park on the Chobe river. Children aged 6 years and older are welcome. As our lodges are in wildlife areas, children should be under the care of a parent/guardian at all times. The electricity is generator supplied, and runs on 220Volt AC with standard South African three-point plugs in each chalet. A torch is provided for use when the generator is switched off during the night.